The revelation in last month’s article (“A neighbor’s correspondence seeks Park Mile change”) concerning Brookside resident Jan Wieringa’s letter to the city brings up the issue of whether the Park Mile Specific Plan should be changed, as implied by her letter. It is worth reviewing not only how low is the allowable density under the adopted Park Mile Specific Plan, but also how the developer’s proposed height and number of units in the block across from Wieringa’s 8th St. home will be even lower than permitted by the Plan. ALLOWABLE height and density for CIM Group’s “Wilshire Mullen” property under the restrictive Park Mile Specific Plan. View looking northwest. Even more interesting is to reflect back to the 1970s … and to what was being proposed at the time when the Wilshire Homeowners’ Alliance began a fight for—and won—the ultimate, extreme low density that now exists in the Park Mile. For much of the land adjacent to Brookside (not even called that back then), there was a specific development proposal reported on the front page of the August 1978 Larchmont Chronicle. For only the blocks between Tremaine Ave. and Rimpau Blvd., between 8th St. and Wilshire Blvd., architecture firm Leo A. Daly Associates was proposing a 330-unit “residential park.” Three schemes, which would have closed Keniston and Hudson avenues south of Wilshire for one block, incorporated a mix of high-rise towers up to 27 stories and low-profile town houses. The land for this 330-unit condominium proposal, which the developers named “Cathedral Park,” was vacant. It had been vacant since before it was purchased in 1923 by the Roman Catholic Archdiocese as a site to replace downtown’s St. Vibiana’s Cathedral. This Leo A. Daly plan was one of many developer proposals held up by a building moratorium initiated by Councilman John Ferraro in response to local constituents’ desire to have a Park Mile Specific Plan adopted first. After adoption, Leo A. Daly’s proposed 330-unit project could not be built; the Archdiocese sold the land; seven RD3 (“Restricted Density”) townhomes and an office building (now the House of Lebanon) were constructed between Tremaine and Keniston; and Farmers Insurance built the two, three-story office buildings now on the remainder of the land along Wilshire between Keniston and Rimpau. All this was done in conformance with the newly adopted Park Mile Specific Plan. What is today allowable on the remaining vacant former Farmers property east of Rimpau, extending to Muirfield Road, also is subject to the density, height, setback, parking, and other restrictions of the Park Mile Specific Plan. These restrictions clearly are far more limiting than what the developers sought in their late 1970s proposal for 330 units and 27 stories. The adopted restrictions only allow three stories for new buildings, and the allowable density is very low. 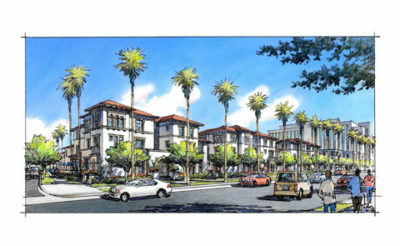 Not including the existing, historic, seven-story Farmers tower, and assuming that a new parking structure is built above ground to provide the required parking for offices in that tower, the zoning allows only 30 units, three-stories tall, along Wilshire Blvd., plus a five-unit three-story RD3 townhouse building and a ten-unit three-story RD3 townhouse building along 8th St., plus the parking structure up to three stories tall along Wilshire. The accompanying drawing depicts that allowable height and density. The drawing shows a total of 45 new units allowable on the vacant parking lots. If the parking for the office tower were built underground, then 14 additional three-story units could be built on Wilshire, totaling 59 new units on the vacant parking lots. By contrast to the 45 (or 59) units allowed, the current CIM Group proposal is to have 34 units on those vacant lots. As presented to the community and the city last fall, CIM Group proposes eleven condominium townhouses, two-and-a-half stories tall, on the Wilshire frontage in the western block that has the existing tower and three triplex buildings, three stories tall, on the Wilshire frontage in the eastern block (nine condominium units total). PROPOSED use of the vacant parking lots per CIM Group’s October 2015 applications to the City. Shown are the three triplex buildings and several townhouses along Wilshire. View looking southwest. In the remainder of that eastern block, the proposal is for eight freestanding, single-family condominium homes, two-and-a-half stories tall, and six two-story single-family homes along Eighth Street. That equals 34 units on the now-vacant lots, with the balance of the allowable units proposed to be in the historic tower. Along 8th St., in the western block containing the existing tower, CIM Group proposes only a deck and swimming pool, in lieu of the allowable three-story townhouse building with five units. The total number of Park Mile-allowable residential units on these two blocks is significantly lower than the density proposed by Leo A. Daly in the 1970s. That proposed density would have allowed approximately 198 units on the land where CIM Group proposes to follow the Park Mile’s allowable maximum unit count that is in the mid-80s, which includes the units to be in the existing historic tower. Guzin wrote further: “[T]hat selfish approach meddles with the Plan that has provided the highly-successful protections for all of our neighborhoods for nearly 35 years. I really urge you to try to educate your residents, some of whom may be relatively new to the area, that all of us … already have very advantageous adjacent zoning. The next public discussion of the CIM Group proposal for the former Farmers property takes place the afternoon that this March issue of the Larchmont Chronicle is distributed. A Park Mile Design Review Board consultation with the developer begins at 4 p.m. on March 3 at the Memorial Branch Library, 4625 West Olympic Blvd. The public is welcome to attend and testify.